Kellermans Event Center 5 out of 5 based on 15 ratings. 15 user reviews. We fell in love with this venue the second we walked up the staircase! It was exactly what we were looking for and we loved all of the unique details. The staff at Kellerman’s did a great job on our wedding day and helped take down and pack up all of our stuff at the end of the night. Beautiful & Unique Wedding Venue! My fiance and I loved it immediately, from the arched wooden ceilings with beautiful beams and light fixtures, to the hand built shop fronts along the side of the room. It is so unique from just a simple ballroom everywhere else, and the price is extremely affordable. Everyone was also very easy to work with and were easy to keep in contact with from the day we reserved the venue til even after the wedding. The day of the wedding, everything went perfect, from the set up to the reception. All the guests loved the venue. I would recommend this beautiful place to any bride! The lighting was amazing and all the decorations were antique. The owners go to antique shows and know how to fix up antiques without taking away from the old look. The owners were so easy and great to work with. They were always updating me on the new pieces they placed in the venue and asked if I wanted them. All of my guests were blown away by the beauty of the venue! Beautiful, unique, charming….I could go on and on. I would highly recommend this lovely venue to anyone planning a wedding. The staff go above and beyond, which is appreciated by any couple/family on such an important event. There are so many beautiful details inside and we still receive compliments from our guests on the entire Wedding. We could not be happier! Thank You Kellerman’s! This is such a beautiful and elegant venue! The owners are perfect at what they do! NOT to brag about my wedding.....but it truly was one of the best and I owe that in LARGE part to Kellerman's Event Center. We had an 11 piece band which was great for the space. There is a large projection screen which is fun to use all night (we had clips playing during the dancing). All in all this is a great mix between elegant and classic with a rustic chic vibe. BEAUTIFUL. You won't find anywhere better! 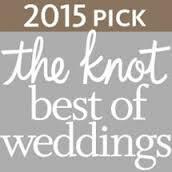 We had our wedding ceremony and reception at Kellerman’s and it exceeded our expectations! We worked with Sheri who is the event planner with Kellerman’s and she went above and beyond to make sure things were taken care of and we didn’t have to worry about a thing. Kellerman’s has so much character and is very unique and Terry, the owner, and Sheri are extremely easy to work with. They also have a garden area that is decorated beautifully and is a great spot for pictures. Kellerman's is an AMAZING venue!! My husband and I had our reception there in November of 2013 and I couldn't have been happier! Terri and Sherri are so helpful, they were always very quick to respond to any questions I had via email or phone. Sheri was so helpful when we met to plan the details of our reception, the night we came in to decorate and down to the last minute we were at the reception hall the night of our wedding. My guests were commenting on how unique and beautiful the space was all night long. The staff is easy to work with and very timely in their responses. I would highly recommend Kellerman's Event Center. It was wonderful working with Terry, Lorah, and Sheri to get all of our details planned for our special day. They helped us down to every little detail and we didn’t have to worry about anything on our wedding day. This location is beautiful and we continue to get comments from friends on how unique and great of a location it is. This place is a MUST SEE if you are looking for a memorable and unique location. Kellerman's is a romantic & chic place to get married. Stunning Venue, Wonderful Service, Great Price! My husband and I couldn’t have been happier with Kellermans. It was an absolutely beautiful venue - one of a kind!! If you like vintage and rustic themes, this place is perfect. Such incredible decor that we basically didn’t add anything ourselves. Our guests loved this place, too! Terry and Sheri are great to work with... so easy going and helpful. They make you feel valued and important.